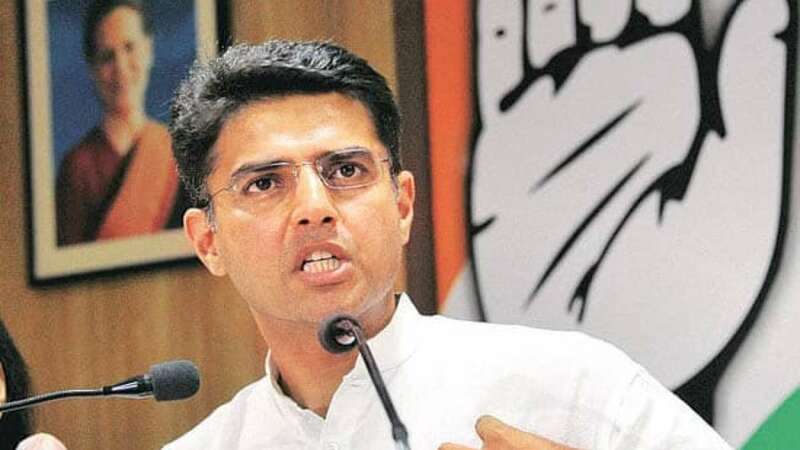 Jaipur : Sachin Pilot, who played a crucial role in Congress' return to power in Rajasthan, is a suave, urbane and charismatic leader who is equally at ease with rural masses as in TV debates. Pilot, 41, who took oath on Monday as Deputy Chief Minister of the state, was appointed Rajasthan Congress chief in 2014 to revive the party in the state after it suffered its worst defeat managing only 21 seats in the 200-member Assembly. He worked meticulously over the last nearly five years in cooperation with senior state leaders to ensure that the Bharatiya Janata Party is voted out of power. But the verdict was not entirely to the satisfaction of the Congress as the party fell two seats short of the majority. It was the nature of the verdict, with the Congress dependent on a bit of external support, that perhaps prompted party President Rahul Gandhi to choose Ashok Gehlot over Pilot in the leadership sweepstakes. But Pilot staked his claim strongly and the power sharing formula was worked out after prolonged discussions extending over three days with both the leaders staying put in Delhi to convey their views. During the campaign, Pilot highlighted the "agrarian distress" and unemployment as key issues as he also sought to harp on the anti-incumbency against the Vasundhara Raje government. The big challenge now before Pilot and Gehlot is to deliver the state to the party in the Lok Sabha Polls that is five months away. That will call for coordinated efforts in governance and early fulfilment of key promises. The BJP's better-than-expected performance shows that it is capable of bouncing back in the Lok Sabha polls and Prime Minister Narendra Modi is expected to run an intensive campaign. Son of former Union Minister Rajesh Pilot, Sachin is a prominent next-generation leader, who has an easy connect with people and is approachable and affable. The Congress will require a sizeable backing from the youth for winning the Lok Sabha polls and as such younger leaders such as Pilot are likely to be in the forefront of the party's poll effort. Pilot has multiple interests, including aviation, and received his private pilot's license (PPL) in 1995. He is also a keen sportsman and has been commissioned as a Lieutenant in the Territorial Army. Born on September 7, 1977, he studied at St. Stephen's College (University of Delhi) and later pursued MBA from Wharton Business School in the US, where he specialised in multinational management and finance. At 26, he was the youngest member of Parliament when he first got elected to the 14th Lok Sabha from Dausa in 2004. Upon his re-election to Lok Sabha in 2009 from Ajmer, he was appointed Minister of State (MoS) for Communication and Information Technology and sought to bridge the technology gap between rural and urban areas. In 2012, he became Minister of State (Independent charge) of Ministry of Corporate Affairs. Pilot was selected as one of the Young Global Leaders by the World Economic Forum in 2008. Pilot is married to Sara, daughter of former Jammu and Kashmir Chief Minister Farooq Abdullah.